It’s not Nixie cuff links yet, but we’re seeing a lot of potential for a few very classy accoutrements with [thouton]’s Nixie tube necklace. The build was inspired by this much clunkier necklace that found its way onto the MAKE blog. Unlike the previous necklace, [thouton] used a much smaller Mullard ZM1021 indicator bulb. Instead of the normal 0-9 digits in a Nixie, this tube displays only A V Ω + - % and ~, betraying its pedigree as part of the display from an ancient multimeter. To power the bulb, [thouton] is using a single AA battery and a boost converter salvaged from a camera flash unit. 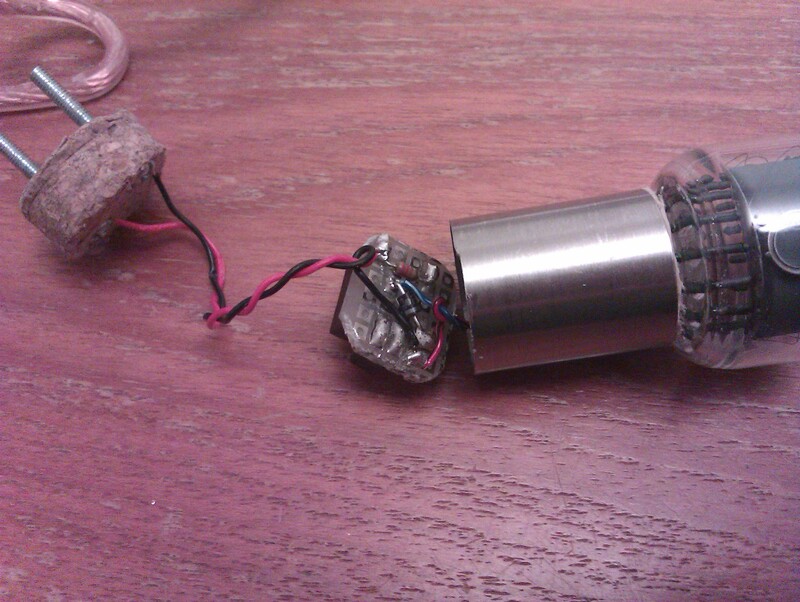 All the circuitry is on a little piece of perfboard encased in a handsome aluminum tube. Power is delivered through two terminals with a bit of audio cable standing in as the chain of the necklace. We suppose this could be re-engineered to use a coin cell battery; although a coin cell doesn’t offer as many amp hours as a AA cell, [thouton] is confident the AA will last for a few days. A coin cell would be more than enough for a night on the town, though. Nice, maybe use one of the Supertex EL drivers as they can do >150V which is fine for Nixies. Camera flash transformers work well but are known current hogs, unless you use a unijunction or series multivibrator to “blink” them with a series diode and parallel capacitor to stop the transistors frying with back EMF. I’m skeptical about this, but I would love to be proven wrong. I would love to make one of these, or cufflinks with a few neons, I have about 50 russian INS-1’s that would be awesome for cufflinks. But I cant find any info on the power supply he used…. anyone have an idea? The circuit is simple, it uses an inductor and a transistor to charge the capacitor. You will not need the capacitor, switch, and flash bulb as you want constant high voltage to your tube, so simply omit them from the circuit. This reminds me of the Adafruit iCufflinks, or iNecklace, but cooler. Is there a possibility of the nixie breaking, or is it made of something like Pyrex?